There was no sound proofing. I was on the 6th floor and could hear all cars driving by, people yelling in the street, and of course, the train going by several times an hour all through the night. The heat radiator was always rattling a pipe every time it turned on. The hot water pressure was almost not existent so it was very difficult to shower. cold water was fine, but i didn't want to freeze to death. My room did not seem to have a do not disturb sign so housekeeping always tried to enter the room at at 8am in the morning while I'm trying to sleep. The only thing that kept them out was the door latch. Even with the deadbolt on, they could see open the door. On the 12th floor I could hear the subway as if it was next to the window. I could not sleep in my entire stay. To me it's a big no, no. When you travel for business, and you work long hours, you need to be able, at the very least, to have a proper sleep. Requested blanket, room was freezing/drafty with air conditioner and heater hardly did anything, gave me a dirty blanket with someone’s hair and sticky red lollipop all over it, had to go downstairs and get another, who knows if that was clean. Left from noon to midnight and when I came in, room had not been cleaned and I had no fresh towels in the morning, had to use the wet ones on the floor. Noisy trains, banging pipes, and lets not even talk about the shower- poor water pressure and wouldn’t get hot, was shivering in there. They did fix the tub which wouldn’t drain, first day was up to my knees. Convinent location, nice front desk staff. The reason it was so horrible ia that the heating system gets louder ot seems as the night goes on. Impossible tp sleep. I speak tonthe front desk and they say the engineer will look at it. Really? Like they dont know leople always compalin about it. They should not have those rooms available to customers. Will never return. Take your business somewhere else t9 enjoy a good nights sleep. Staff was just so sweet and kind. And accommodating! Made my getaway perfect! I booked through Orbitz, got to my room after a trying flight to be informed I wasn't in the system...they had no record of me until I had the confirmation e-mail sent to the front desk.This is the last thing one wants to hear!!! No apologies .....no response from the night desk...….. but booked a room....I found it disrespectful and discourteous. The location is in downtown and so close to bean square. It really made me satisfied. Was a terrible stay. We liked the location and the price, but that’s where it ends. We booked a king suite got a 2 twin bed room that smelled like urine. Also couldn’t sleep because the radiated heater was knocking and making loud songs throughout the entire night. Great location and friendly staff. The room was large and clean, though rather basic and a little tired — the door stuck, the lights were dim. Also our room was a bit noisy between the train outside and the people in the room next dooor. Given that this place was a lot less expensive than nearby hotels, I’d say you get what you pay for. This is a very old hotel in dire need of refurbishing. There was a train what seemed like right outside my window every few minutes all night long. Just OLD!!! I got bite by a spider on the bed. Room was a slop. The hotel was nice, very close to Grant Park. Check-in was quick and easy, the staff was friendly. My room was kept very clean and fresh towels supplied daily. The bathroom was small, but there isn't much to be done about that. There was no microwave or refrigerator, but I had no need on this trip. Super conveniently located to attractions, included no the Signature Lounge! We loved it! Close to downtown and the elevated train parking was a issue 44.00 a night. 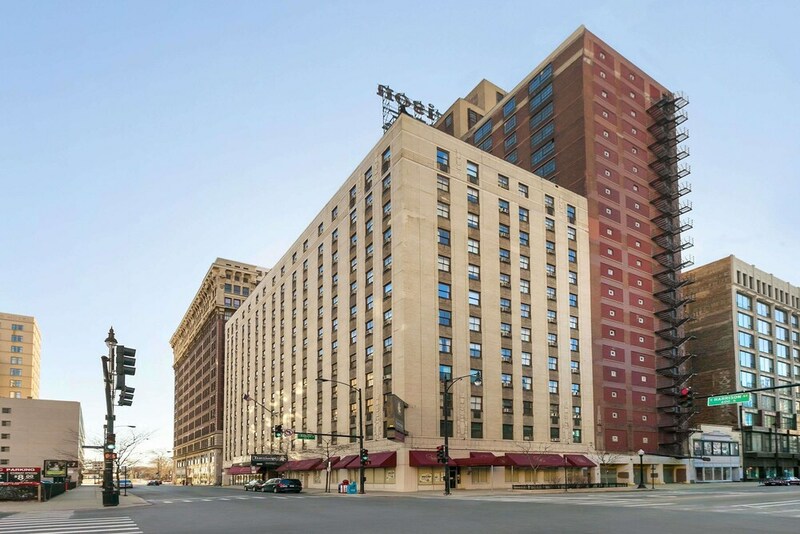 Located in The Loop, Travelodge by Wyndham Downtown Chicago is next to popular attractions like Columbia College Chicago and State Street. This 233-room hotel welcomes guests with conveniences like 2 restaurants, free in-room WiFi, and a business center. Enjoy dining at one of 2 onsite restaurants including Luna Cafe, which specializes in American cuisine. Start each morning off right with cooked-to-order breakfast served for a fee. A TV comes with satellite channels, and guests can stay connected with free WiFi. Other standard amenities include a coffee maker, free weekday newspapers, and free local calls. Guests of Travelodge by Wyndham Downtown Chicago enjoy access to free WiFi in public areas, conference space, and a business center. Valet parking is available for USD 44.00 per night, and there's also limo/town car service. Multilingual staff at the front desk are standing by 24/7 to help with concierge services, luggage storage, and dry cleaning/laundry. Additional amenities include free newspapers, laundry facilities, and an ATM. Thank you for all your feedback and input. I apologize for any inconvenience. We really appreciate your patronage. Thank you for your time and input. We really appreciate your feedback. We do have rooms on both sides of the building. I apologize we could not exceed your expectations. We really try to be the best budget hotel downtown. We have been so busy and I am very sorry for any inconvenience. Thank you so much for your score. We really appreciate all of our guests and reviewers. I am so sorry we could not exceed your expectations. I really apologize for any inconvenience. Thank you for the 5 stars! Our staff will really appreciate your feedback! I hope we have the opportunity to serve you again in the future! Thank you for your feedback, we will check with orbitz to see why they did not get us the information. We do respond to all emails we get. I am so sorry. Thank you for the review! We really appreciate all of our guests and reviewers. Luna Cafe - Restaurant specializing in American cuisine and serving breakfast and lunch. Thai Spoon - Restaurant specializing in Thai cuisine and serving lunch and dinner.